On days whereby all of us were not feeling very hungry, we go to explore cafes. So this week we visited Stateland Cafe in Kampong Glam area. The lovely ladies tried Eggs Benedict Poached eggs on top of pork ham and brioche toast, topped with sauce hollandaise, served alongside home-made tomato chilli jam and stewed mushrooms and Classic Honey Toast thick-cut toast baked with honey and salted butter served with fresh fruits and honey yoghurt ice-cream. My only comment about the eggs benedict was the sourish chilli jam that wasn’t to my liking. The raspberries and blueberries served with the toast was also extremely astringent. I had the Toffee Nut Waffle Classic yeast raised waffle scented with a hint of Toffee Nut, served with toasted almonds and vanilla ice-cream. The texture of the waffle was chewy and spongy in the middle unlike the others that are typically fluffy inside. I wasn’t used to the dense texture of the waffle. However the toffee nut syrup was well-balanced, not too sweet. I particularly liked the nutty aroma of the toasted almonds. 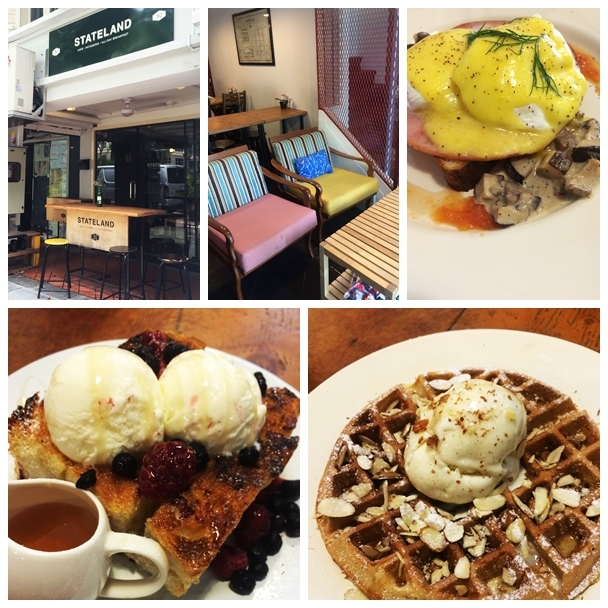 This entry was posted in Bistro & Cafe, Singapore, Western and tagged Bali Lane, Eggs Benedict, Honey Toast, Kampong Glam, Singapore, Stateland Cafe, Toffee Nut Waffle, Waffle. Bookmark the permalink.